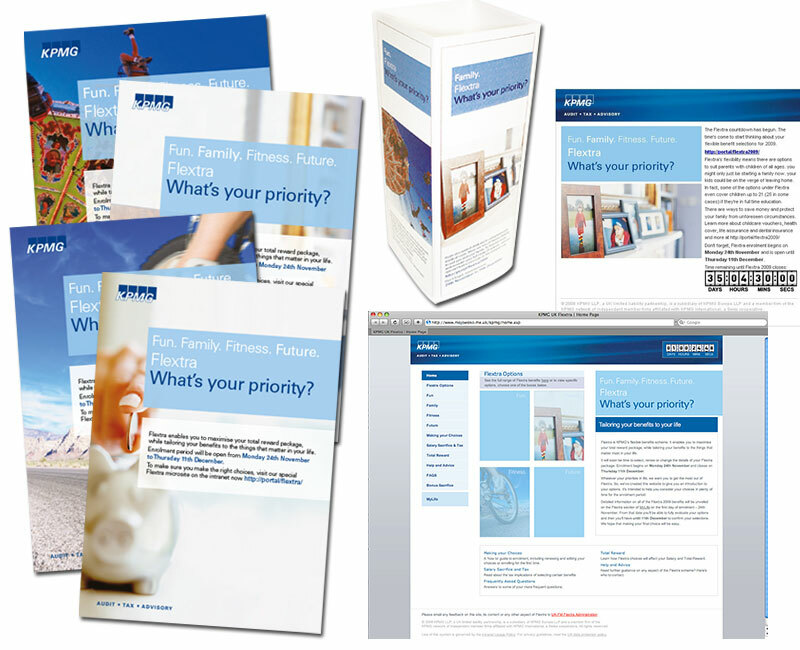 WDAD designed and implemented a multi-channel flexible Benefits programme for all of the UK’s leading employers. For leading employers like KPMG, benefits packages are a key tool in attracting, retaining and engaging talented people. KPMG’s reward packages feature numerous core benefits such as pension, life assurance and health cover. Through the firm’s flexible benefits scheme, Flextra, the workforce can also select from a wide range of additional benefits. The scheme had been running for a number of years and WDAD was briefed to create a new marketing campaign to raise its awareness. WDAD recognised that uptake wasn’t affected by a lack of awareness of the Flextra scheme per se. Surveys showed that almost every employee knew about it. Instead, our challenge was to increase uptake by identifying and then overcoming the barriers that were preventing people from choosing flexible benefits. Our strategy focused on highlighting the specific benefits of the scheme to specific target audiences. The key was to make the process of choosing Flextra benefits as easy and user-friendly as possible. The principle we followed was very similar to the way that Sky, for example, bundles up its TV channels into packages. We grouped various benefits into similar bundles; Fun, Family, Fitness Future, with all traffic being driven to a specially created microsite which presented information clearly and concisely to time-poor employees. In difficult market conditions, take-up remained consistent with the previous year, which represented a good ROI for the campaign – while feedback from KPMG employees about the new approach was very positive.